Curious George was one of my favorite children’s books series. A monkey who gets in and out of trouble? A monkey who, strangely enough, lacks a tail? Now that is something a child can identify with. The series was written and drawn by Hans A. Rey and Margret Rey, Jewish refugees from Nazi Germany who fled from Paris to Brazil in 1940 and began writing these books in 1941. Forget the TV program (PBS) and the film – the books have a whole different dimension. But I must admit: Jack Johnson did a really nice job on the songs for the movie. 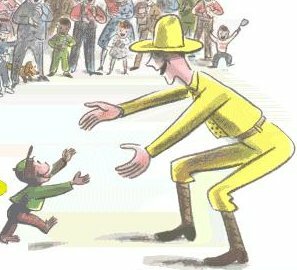 He connects up with the gentle melancholy that is buried at the root of this amazing story of friendship between the Man in the Yellow Hat and a chimpanzee.